Combine jalapeño, lemon zest and yuzu juice in a small dish and set aside. Heat half the oil in a large sauté pan. Add the onion and cook on medium-high until it starts to caramelize. Remove it. Add the mushrooms to the pan and cook until they start to brown. Return the onions to the pan, add the tomatoes and cook until they start to dry out. Pulse the mixture in a food processor until very finely chopped. Add the jalapeño mixture and season to taste with salt and togarashi. The mixture should have a touch of heat. Bring a pot of salted water to a boil for the pasta. Heat the remaining oil in the sauté pan on low. Add the garlic, cook until it softens, then add the wine. Increase heat to medium high and reduce until the wine films the pan. Add the stock and the tomato mixture. Stir, then add the crab. Cook the pasta until it is al dente, about 3 minutes. Drain and add it to the sauté pan. Add the butter. Use tongs to toss all the ingredients together. Divide among 4 warm plates, scatter tarragon on each and serve. 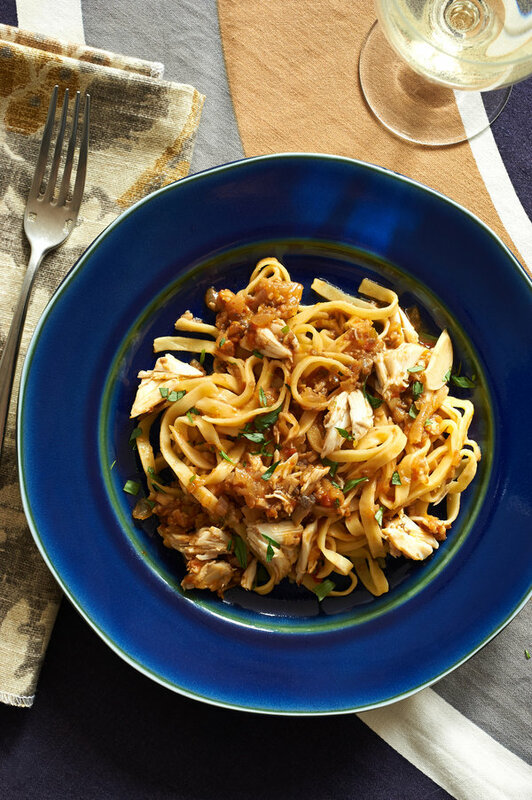 Share the post "Pasta with Crab Meat"
It looks yummy! Apart from cooking, the dishes made of love of mother make us grow up and feel warm in the heart. being on a diet i should cut down the food contains a lof calorie ,but hard for me not to be temptated wt it.